वैंपायर don't sparkle. . Wallpaper and background images in the Critical Analysis of Twilight club tagged: vampires sparkle twilight harry potter snape hufflepuff. Epic fail या epic win? Yeah!! Snape is the BEST! you tell him snape! snape is the coolest teacher ever! Oh, Snape. You make me smile! @ any one who says Edward is a fairy. Ha! eddi-poo just got owned by snape in your face oh yeah and i think smeyer is a monkey! Who the heck came up with that??? I have actual tears of laughter rolling down my face! Ha ha! i bit me tongue it was that funny"
Snape is my favourite bad guy"
XD There isn't a word for how awesome Snape is! i know this is late, but 'fairies' are technically not the mean ones. in england and ireland, they are just the really tricky ones. they aren't mean, they'll just kidnap you and keep you. its pixies that are mean. thanks. maybe Edward's dad in Harry Potter was half DISCO BALL..
get the point?? Mr. Diggory is ROUND. SPARKLY. and can FLOOAAT. 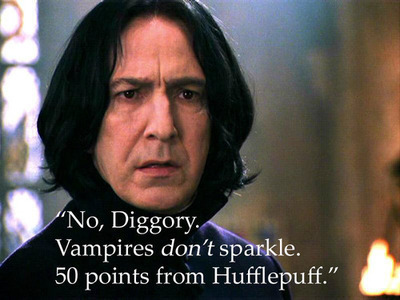 so.. Cedric Diggory matured, turned 17, got sick, got bitten by Carlisle, changed his name, and before turning to a vamp, GOT HIS FATHER'S GENES AND TURNED INTO A HUMAN DISCO BALL. hello? that is called SPECIFIC.